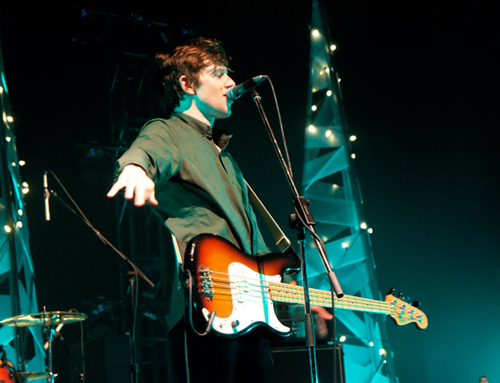 The Christmas spirit was definitely in the air (along with a few other things) at the Sound Academy on December 15th, as Tokyo Police Club, Hollerado and last minute guest Topanga played for a very cheerful crowd. Amidst the chaos, Hollerado played their singles “Pick Me Up,” “Good Day at the Races,” “Juliette” and a track which lead singer Menno Versteeg presented as “a song about a homophobic man.” Versteeg also told a short story about a man with a unibrow who biked past him and apologized for having a unibrow (sometimes it’s just one of those days). One of the highlights of their set was their song “You Got To Lose” which built up to a crowd sing-along of the chorus “You got to lose love if you want to find love” and a fakeout ending. The boys played a “new” song (although they’ve been playing it live since the start of the summer) called “Argentina,” which had a bit of a Vampire Weekend vibe to it, and a more grown-up feel for them. Hopefully we hear more new material from them sometime near the start of the new year. As the artificial snow continued to fall, Tokyo Police Club played “Let It Snow,” which seamlessly transitioned into their song “Frankenstein.” They were later joined by Menno Versteeg of Hollerado during the encore for a duet of another holiday classic, “Christmas (Baby Please Come Home),” which they both clearly poured their hearts into.